Luxury carmaker Mercedes-Benz yesterday entered the premium used-car market with its StarElite Pre-Owned Program, in a bid to garner more market share and support its businesses in the country. "We have come out with StarElite, a sub-brand under the Mercedes-Benz umbrella, as part of our overall market strategy for the country. It would also be our debut in the pre-owned vehicle market," said Bjoern Hauber, general manager of sales and marketing, Mercedes-Benz (China) Ltd. According to Hauber, StarElite offers multi-brand trade-in, certified pre-owned vehicles and premium after-sales service, in a transparent, reassuring, and convenient one-stop shopping experience. "With multi-brand trade-in, a customer can bring any vehicle brand to the dealership and get the same appraised by a StarElite professional. After an objective and transparent inspection of the vehicle, the appraiser would calculate the value of the old vehicle and also offer customers the option of trading in the same for a new Mercedes-Benz or a StarElite pre-owned Mercedes-Benz vehicle after reducing the exchange value," said Hauber. The StarElite facility would be available in 11 cities and 15 showrooms. "We intend to add another 10 to 15 StarElite dealerships next year," said Hauber. Going forward, Mercedes-Benz plans to have StarElite pre-owned vehicle showrooms at all its dealerships, he said. The used-car market is still in its infancy in China and has been growing at a slow pace. The first instance of a second-hand car purchase took place in 1988 when a Beijing resident bought a Fiat 126P. However, with China's automobile industry maturing and vehicle sales surging, the used-car segment has also started to gather steam in recent times. According to figures from China Automobile Dealers Association (CADA), used-car sales have risen from 252,000 units in 2000 to 2.74 million units last year. During the first eight months of this year, trade-in vehicle sales touched 2.06 million units, up 25.29 percent over the same period last year. "We expect used-car sales to cross 3 million units this year and grow further in the next few years," said Hauber. In the Western markets, used-car sales normally account for 1.5 to 3 times new automobile sales. However, last year, second-hand sales accounted for just 30 percent of the new vehicles sales in China. "We see huge potential and a promising future for the used-car market in China," said Hauber. The government is likely to launch a slew of policies over the next few months to regulate and encourage the second-hand vehicle sales in China. The era of second-hand vehicles is certainly coming, said Shen Rong, deputy secretary-general of CADA. Shen said the Ministry of Commerce has worked out a policy jointly with the Ministry of Finance to establish standard second-hand vehicle trading markets in 10 cities and provinces from this month onwards. "It is the first step the government would implement this year. The national standard for second-hand vehicle enterprises and second-hand vehicle appraisal are under discussion and would be released soon," said Shen. 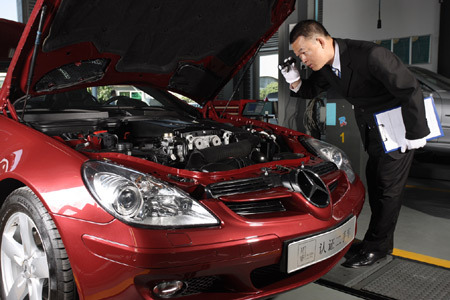 Mercedes-Benz is not the first automobile brand to launch a specific used-car service in China. Its German rivals Audi and BMW are already present in the used-car market. "What makes Mercedes-Benz different from others is in its use of an independent third-party audit for the transaction. Dekra, an independent automotive inspection agency, will guarantee the transparency of the trade-in evaluation and certification," said Hauber.